Raytheon Company has begun flight-testing the airborne component of DARPA’s Persistent Close Air Support program (PCAS-Air), entering Phase 3 of the program, according to a company release. The program is designed to speed close air support to soldiers on the battlefield. PCAS Phase 3 is an 18-month, $25.5 million effort scheduled to culminate in live-fire demonstrations. Raytheon is the systems integrator for PCAS and leads an industry team comprised of Rockwell Collins, General Electric, BAE Systems and 5-D Systems. PCAS is being developed to enable ground troops, JTACs, and combat aircrews to share real-time situational awareness and weapons systems data. With PCAS, soldiers on the battlefield can quickly and positively identify multiple targets simultaneously. JTACs and aircrews will jointly select the best precision-guided weapons for each target while minimizing collateral damage and friendly fire. Pilots, forward air controllers, Joint Terminal Attack Controllers (JTACs), or other troops on the ground calling in air support currently must focus on only one target at a time, usually using voice directions and possibly a common paper map, according to DARPA. An airstrike can take up to an hour to be arranged and have the aircraft arrive on station, during which time targets can move or even attack first. The PCAS-Air component “would be a platform-agnostic, plug-and-play system that would consist of an internal navigation system, weapons and engagement management systems, and high-speed data transfer systems. Based on tactical information, PCAS-Air’s automated algorithms would recommend optimal travel routes to the target, which weapon to use on arrival and how best to deploy it,” according to DARPA. 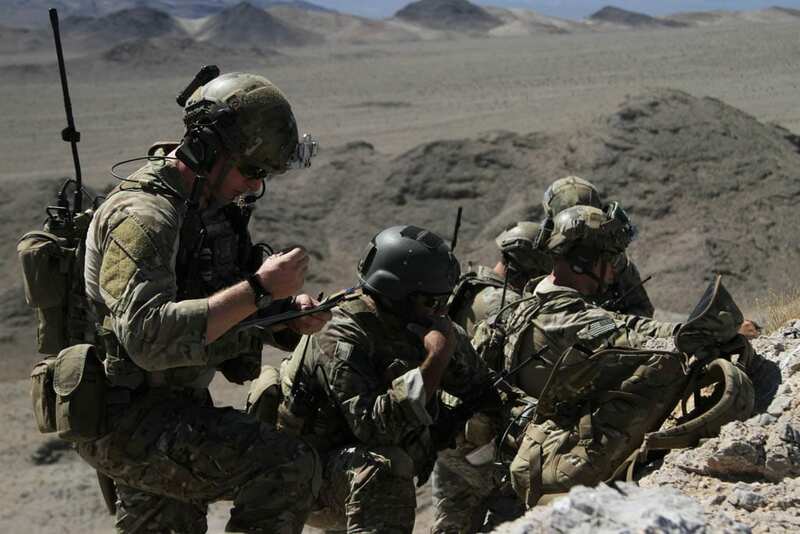 From December 2012 through March 2013, DARPA field-tested parts of PCAS-Ground in Afghanistan, deploying some 500 Android tablets equipped with PCAS-Ground situational awareness software to units in the field. According to DARPA, PCAS-Ground replaced those units’ legacy paper maps, and dramatically improved their ability to quickly and safely coordinate airstrikes. The PCAS-Air component “would be a platform-agnostic, plug-and-play system that would consist of an internal navigation system, weapons and engagement management systems, and high-speed data transfer systems. Based on tactical information, PCAS-Air’s automated algorithms would recommend optimal travel routes to the target, which weapon to use on arrival and how best to deploy it,” according to DARPA. Current flight testing will test PCAS-Air performance on an A-10 Thunderbolt aircraft and connectivity with a JTAC equipped with a PCAS-Ground kit, according to Raytheon. The key element of PCAS-Air is modular smart launcher electronics that can be easily ported over a variety of platforms across the services. Once Phase 3 flight-testing is complete, the PCAS system will be available for integration and testing with other aircraft both fixed and rotary-wing.